Grimgrimoire is a Vanillaware game so by the same people who did Odin Sphere, Dragon's Crown and Muramasa i.e. it's worth actually playing . Oh and it seems to be selling for between £25-£30 on ebay so another amazing find! Yeah, that's what I like about Odin Sphere: most of the characters control differently. I personally preferred Gwendolyn and Velvet when I 100%ed the PS2 version years ago. So far in the PS4 version, I'm only up to Cornelius' section as I just haven't had time to really hammer the game. A Gamecube game in the wild, first time in a bit... Prince of Persia Two Thrones - mind condition £1. Also, Tetris Tower 3D board game... you can "touch, feel and control the pieces" - as the box proclaims! A rather odd game £2. 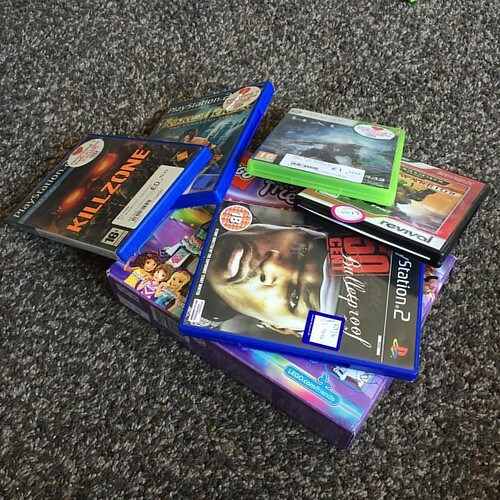 We have loads of charity shops in Westbourne near where I live but all the games get hoovered up by their local postman. I went in another charity shop the other day and they wanted Rogue Squadron on N64 for £30. What, you live in a hotel? Stopped in at a few today. Mrs Rocky and I were donating a car full of stuff. Nothing new sadly, however I did witness someone trying to return a book after they had read it !! If you decide to get rid give me a shout please. Cheers mate, really appreciate it. For some reason years ago I decided to get rid of it and the DK CD. Have managed to pick up the DK one again but never the KI. Twilight Princess HD and Tri-Force Heroes Prima guides. Both look brand new and were only 50p each. Good find, I still have the case of the CD, the CD sadly arrived snapped in half in the post, always been on the look out for one since.